Right click on the RSS Feeds folder in your folder list. Choose Properties > Home Page. Clear the Show home page by default for this folder check box, and then choose OK.
For help adding RSS feeds to Outlook, see Subscribe to an RSS Feed. For help removing RSS feeds from Outlook, see Unsubscribe from an RSS Feed. 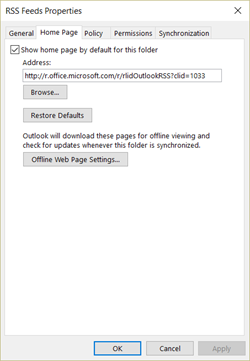 To view your individual RSS feeds in Outlook, click the arrow next to the RSS Feeds folder.